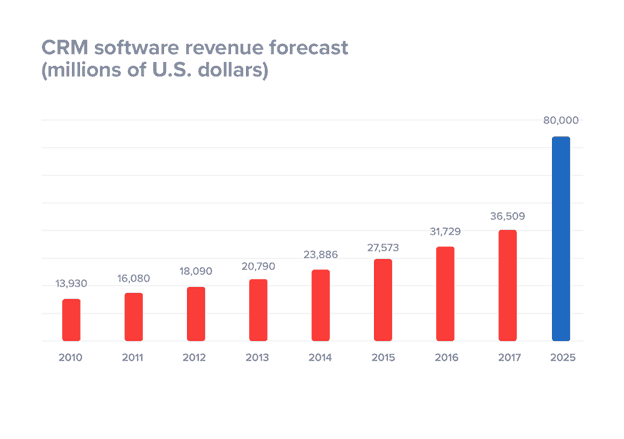 According to SuperOffice, CRM has grown to be “the biggest software market in the world.” In the next six years (2025), it’s expected that revenue will shift upwards in the ballpark of $80 billion. From email marketing to mobile CRM and everything in between, what’s clear is that CRM software is not going away anytime soon. If anything, it’s only going to become more pervasive, slipping into more and more everyday elements of marketing. As the relationship between CRM and marketing strengthens, even more, you may look to implement the software in your marketing strategy for 2019. That’s certainly a wise choice. After all, as SuperOffice breaks down, CRM can help in many aspects of a marketer’s life. 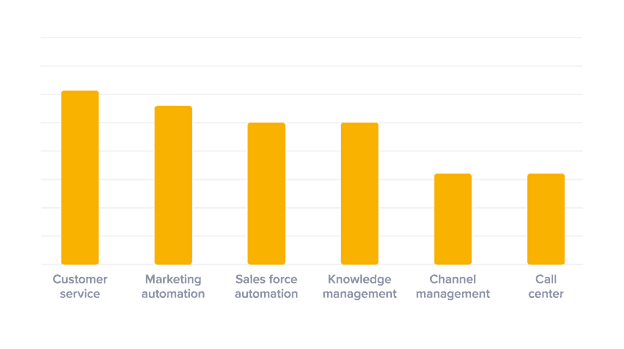 These include call center management, channel management, knowledge management, sales force automation, marketing automation, and improved customer service. If your company is ready to start using CRM, then you don’t want to miss this article. 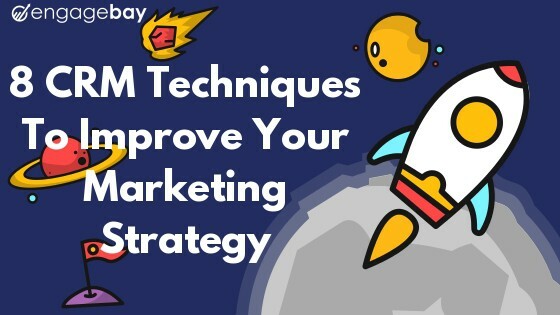 In it, we’ll showcase eight exemplary CRM marketing techniques you can begin using today. We recently published an article on our blog about how CRM and email marketing intersect. Indeed, if you have CRM software, it’s incredibly easy to integrate it with your email marketing to create comprehensive and converting campaigns. You can get alerts letting you know when your customers are opening your emails. It can go even more in-depth than that, as you can see which links customers are most receptive to. Those alerts let you plan the perfect follow-up at exactly the ideal time. Not only that, but CRM can aide you in lead nurturing. This is due to the deep segmentation that CRM software is capable of, which we’ll discuss later in this article. With customizable email templates that include interactive elements, you’re sending the kind of email content your customers actually want to open and read. 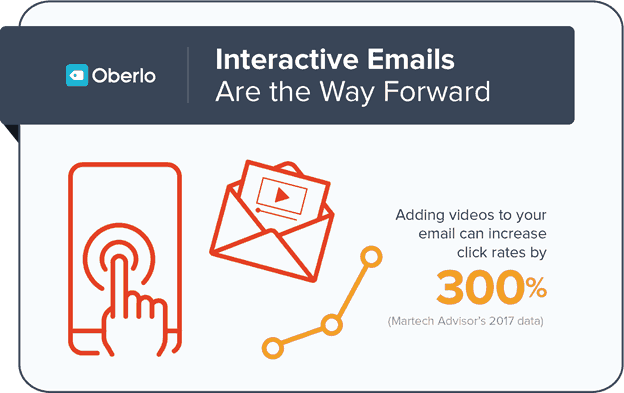 Interactive content can be anything from little email mini-games to a simple video. Social media and CRM are so buddy-buddy that there’s even a term for combining the two: social CRM. What exactly is social CRM? It’s a modern way of reaching out to customers via social media channels like Twitter or Facebook. It can also include email, chat, text, and even phone communication, but social media is the star. Since it’s CRM software we’re talking about here, the marketer already has a detailed view into each customer. That allows communications to be more meaningful and effective. There’s another element of social CRM that is equally as important as conversions and customer retention. It’s customer service. After all, to keep your customers happy, you want to answer their questions and meet their requests. Yet, according to data from call service company Yonyx, that happens far less often than it should. They found that more than half of companies (55 percent) did nothing with the social CRM customer feedback they received. This is a wasted opportunity. Yonyx adds that a good chunk of customers (17 percent) seek social media for customer service purposes. Social media platforms can also guide purchasing decisions, said 20 percent of the respondents. You can’t always expect that the interaction will be a positive one, at least not initially. Negativity is common, as a portion of customers (35 percent) who seek out your company will do so to complain. Still, if you can turn their complaints around, you could see more customers in the future. Yonyx notes that when customers have a good experience with a company, roughly 70 percent would tell their family and friends about it. To say that cloud-based data storage is growing is an understatement. Statistica, a stats resource, found that 1.8 billion people across the world were on the cloud in 2017. Whether personal or work-related data, they entrusted their information to Internet-based servers. Today, there’s what’s known as cloud-based CRM. This is when your CRM software is stored in the cloud. What’s so convenient about cloud CRM? Everything! You and your staff, no matter how big or small, need only an Internet connection to track your CRM. Did we mention you can do this anytime from anywhere? There’s no need to be tied down to your office computer. Whether it’s a weekday night or a weekend, you can bring your CRM with you. All you need is a stable Internet connection to do so. As you can imagine, this can be revolutionary for businesses looking for more detailed customer insights. New leads are always entering your pipeline, after all, and the job of parsing through and segmenting them never seems to end. Cloud CRM makes it so no potential customers slip through the cracks. Not only that, but you can use your cloud CRM to keep customer contact information up-to-date, send emails at virtually anytime, and quickly contact your sales and marketing teams. According to another article on SuperOffice, this year, companies will shell out $127 billion on cloud CRM and other services. Back in 2014, companies were only willing to spend $56.6 billion. This shows you how much the cloud has grown in four very short years. Without cloud CRM, we’d never have mobile CRM. After all, with cloud-based CRM, we marketers can use our CRM marketing software of choice anywhere, anytime. That includes on any tech as well, such as smartphones, tablets, and other mobile devices. Like the cloud gives us the freedom to target our customers and reach our sales goals around the clock, so too does mobile CRM. With a secure app, we can take our customer insights and marketing campaigns with us anywhere, and all in our pocket, too. According to Innoppl Technologies, it’s possible to meet more sales goals with mobile CRM. Of those sales reps they surveyed, 65 percent of them said they were surpassing quotas with the use of mobile CRM. 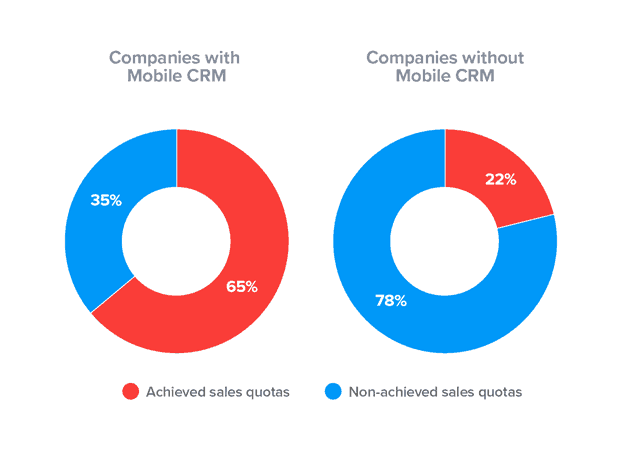 The rest of the respondents, 22 percent, were not using mobile CRM yet still achieved their sales quotas…the hard way. Why make marketing harder than it has to be? As we mentioned in our article about email marketing and CRM, with the software, you can segment your audience more specifically than ever before. The powerful insights you can gain into your leads and customers give you the power to watch your leads go through the customer journey until they come out on the other side as loyal customers. CRM software helps you guide your leads through every step of that journey. You can send emails and other content during the awareness stage, engage and nurture with them, and then gently push them towards product or service purchases. There’s one great way to ensure your lead will successfully complete the customer journey. It’s personalization. Here’s an awesome CRM marketing strategy example about personalization from HubSpot. 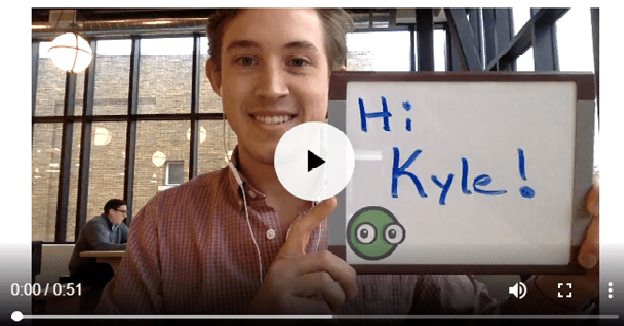 Kyle Jepsen, the company’s Academy Sales Professor, had reached out to a video company called Vidyard. What followed was a 51-second extremely personalized video. In the above screengrab, you can see that the speaker, Cole, had written Kyle’s name on a whiteboard. That’s not much, you’re probably saying. According to HubSpot, though, Cole mentioned certain topics he had spoken about with Kyle as well as the names of some colleagues. As a marketer, you’re not only interested in bringing in new leads, but also keeping the customers you already do have. There are several ways you can do that with CRM software. The first of these is within the software itself. Whether you use cloud-based CRM, mobile CRM, or another solution, you know that all your customer data is easily accessible through the software. Instead of digging through databases and contacts lists, it’s all there for you to parse through anytime you need to. You can update customer information and even cut unresponsive dead-ends if need be. You can also choose to re-engage with these former customers through specialized email marketing. If the re-engagement campaign fails, then so be it. With a combo of CRM and automation, it’s possible to reach out to former customers without putting a lot of manhours into it. Personalization is another useful way to retain customers. We just talked about personalization, and it’s come up many times on this blog, too. Finally, you can track the interactions your customer has from start to finish. As mentioned, CRM gives you a bird’s eye view into a lot of important metrics. Who is opening your emails? Who is clicking links, and which links? Who’s making purchases and how often? By knowing this, you can determine who your most loyal customers are and who may be eligible for a re-engagement campaign. Another of our recommended CRM marketing techniques is using it alongside search marketing. Search marketing, as you surely know, is a means of marketing to improve your search engine standing. You can pay for search engine marketing if you must, but CRM software is useful even if you don’t. How? You already have detailed information and insights into your customers, including their demographics, interests, pain points, and purchasing behavior. Now you just have to take that information and use it in search marketing. For instance, you can use the demographic data you have to tailor your ads. Your advertisements can also be geolocated, so if a customer recently went to one of your bricks and mortar stores, they’ll get ads for their area. Depending on customer behavior, you can also target specific ads and emails to various customer segments. Perhaps you want to re-engage with abandoned cart users. If someone reached out to customer service, they’d see a different message. You’d have yet a third running campaign for longtime customers. The potential for the intersection of search marketing and CRM is nearly endless. While it’s always important to respect the privacy of your leads and customers, if they gave you information, you can use it to market to them. Finally, the predictive analyses capabilities of CRM are one of its most valuable assets. We marketers always wish we could look into a crystal ball and predict the future. That’s why we make trends list and predictions for the year ahead. How accurate those trends and predictions will be is always up for debate. If you want more accurate predictions that are actionable as well, turn to your CRM software. Its predictive analyses use real-world data gathered from your leads and customers. It can predict areas in which you need to improve and those in which you excel. Combined with the detailed analytics your CRM software can provide you and you should have a more comprehensive picture of your marketing campaigns than ever before. That allows you to reap future successes and appeal to your customers in a way that suits them best. CRM software is on the rise, and its ascent is not slowing down a bit. More and more marketers and businesspeople are learning of the value of this software. By gaining invaluable insights into your customer base, you can convert leads and retain loyal customers. The CRM marketing techniques we shared in this article should help you meet your goals. With the end of the year upon us, now is the perfect time to begin planning ways you can succeed in 2019. With CRM, automation, social media, email marketing, and more, that success can be right around the corner. © 2019 EngageBay. All Rights Reserved.